Hello..I am back.This time I am going to do a review of a product. This brand is orginated from Korea.They set up a few outlets in Malaysia.The thing is I am suprised that they set up outlets in my hometown too.My hometown is just a town ,Sibu a.k.a Swan Town. Anyway,I really appreciate the arrival of this brand in the town.Not only me i think,all the girls in the town.Haha.Now,The Body Shop has a new competitors.Fyi,The Body Shop is also available in the town just last year which is same with The Skin Food. What is good about this brand?? 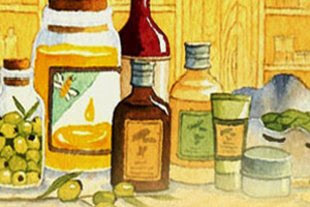 Actually they have products ranging from skin care,body care,make up and so on.The ingredients..guess?They use natural ingredients,the ingredients we eat as food every day like chocolate,black sugar,rice,papaya,kiwi,peach and etc.No bad right?So the products is edible for our skin.The products have different nice scents depends on the ingredient they use.Very mild and natural i could say.Suitable for sensitive skin users. 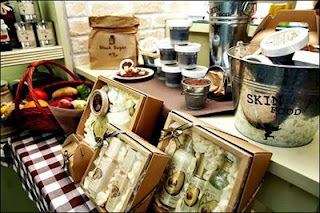 See how nice their packaging are......A gift set of Skin Food for my coming bday? ?I would like that..Haha. Skin Food stuff i bought.I started with mask first because i have not feed my skin with mask for ages.The Kiwi Yogurt mask has a very creamy texture.It smells good also.My skin feel really smooth after using it.The function of this mask is too control oils and pores.Quite suitable for me because my skin type is combination skin.For those who has similar skin type as mine,i would recommend you to try.This mask can be used on daily basis.So good right?Everyday you can pamper yourself with mask.Sometimes i feel like eating it because it really looks like yogurt to me. My second visit to that shop again.Bought this few stuff.Mask again..haha.I try their Seaweed facial foam also.Its good because after i wash it.I don't feel the dryness on my skin.It removes the excessive oil and at the same time keep the moisture also. Want to find out more about this product..Go to www.theskinfood.com ..I hope you will like it..
Well,other product such as make up and body care i haven't try any.So no further info on that.Sorry.But you can try on your own.Because the price is reasonable.If we cant afford to buy some really branded products, this brand is worth a try. 0 comments on "My review"
Living her life to the fullest. Purple is her favourite color. Czy można schudnąć nie stosując diety? you said move on but where should i go? THE CLIO 2 RESIDENCES @ IOI RESORT CITY - SHOULD I BUY HERE?